In an age of uncertainty about how climate change may affect the global food supply, industrial agribusiness promises to keep the world fed. Through the use of factory "farms," genetic engineering, and the widespread application of chemicals, they put their trust in technology and ask consumers to put our trust in them. However, a look behind the curtain reveals practices that put our soil, water, and health at risk. What are the alternatives? And can they too feed the world? The rapidly growing alternative food system is made up of people reclaiming their connections to their food and their health. A forty-year veteran of this movement, Mark Winne introduces us to innovative "local doers" leading the charge to bring nutritious, sustainable, and affordable food to all. Heeding Emerson's call to embrace that great American virtue of self-reliance, these leaders in communities all across the country are defying the authority of the food conglomerates and taking matters into their own hands. They are turning urban wastelands into farms, creating local dairy collectives, preserving farmland, and refusing to use genetically modified seed. They are not only bringing food education to children in elementary schools, but also offering cooking classes to adults in diabetes-prone neighborhoods—and taking the message to college campuses as well. Such efforts promote food democracy and empower communities to create local food-policy councils, build a neighborhood grocery store in the midst of a food desert, or demand healthier school lunches for their kids. Winne's hope is that all of these programs, scaled up and adopted more widely, will ultimately allow the alternative food system to dethrone the industrial. 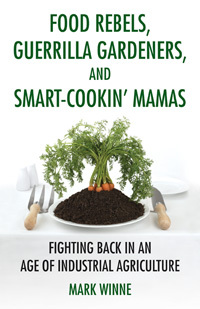 Food Rebels, Guerrilla Gardeners, and Smart-Cookin' Mamas challenges us to go beyond eating local to become part of a larger solution, demanding a system that sustains body and soul.